Changing the way you pack lunch, one school day at a time. 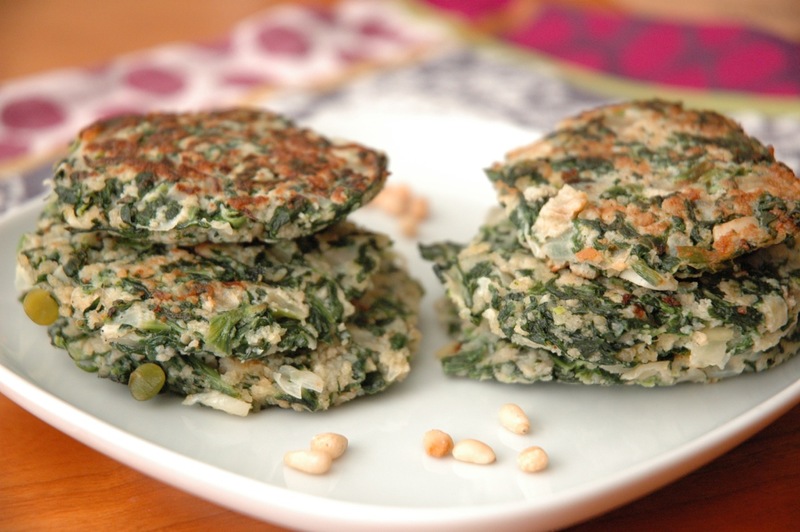 I discovered these spinach patties early last year when we were on a grain-free diet. The original recipe from Epicurious.com calls for breadcrumbs, but at the time I replaced it with more eggs, pine nuts and grated Pecorino Romano. I’ve made these almost half a dozen times and this was the first time I used breadcrumbs. The patties did hold together better, but I don’t think they added much to their taste. Next time, I may try corn meal. It’s a great recipe to experiment with—just don’t leave out the nutmeg. My kids like these for snack time, breakfast, as well as lunch and dinner. S prefers to have wrap her patty with a piece of ham. Meanwhile, C sees it as yummy finger food that he runs around the backyard with. I like them best for a quick, nutritious breakfast. I just pop them in the toaster oven to warm them up and give them a little crispiness. Happy holidays! Enjoy your two-week break from packing lunches. I know I will 🙂 It may be my favorite Christmas gift this year. 1. In a large skillet, heat the olive oil over medium heat. Add the onion and, if using, the garlic and sauté until soft and translucent, about 5 minutes. Remove from the heat and add the spinach, matza meal, salt, pepper, and, if using, the nutmeg. Stir in the eggs. If the mixture is too loose, add a little more matza meal. The mixture can be stored in the refrigerator for a day. 2. Shape the spinach mixture into patties 3 inches long and 1 1/2 inches wide, with tapered ends. In a large skillet, heat a thin layer of oil over medium heat. In batches, fry the patties, turning, until golden brown, about 3 minutes per side. Drain on paper towels. Serve warm, accompanied with lemon wedges. Add 1 cup (4 ounces) shredded Muenster, Swiss, Gouda, or Cheddar cheese; or 1/4 cup grated kefalotyri or Parmesan cheese. Substitute 1/2 to 1 cup finely chopped walnuts for the matza meal. Add 3/4 cup raisins soaked in white wine for 30 minutes, then drained, and 3/4 cup toasted pine nuts.